NOTICE : Scandinavian Gaming Tours are currently not available. Please enjoy viewing our website and the pictures of Scandinavia and the other locations worldwide for free and enjoy an internet visual tour of some of the worlds most beautiful places courtesy of Scandinavian Gaming Inc..
For the year 2009 Scandinavian Gaming Inc. will only be offering group tours. Group tours shall consist of 10 or more people only. Therefore get your friends and family together and contact us for the best trip of your life. Also some trips listed below may not be available. To Contact us to ask questions or for more information please use the feedback space at the bottom of the page. All prices are subject to change. Scandinavian Gaming Inc. would like to thank WPBT Public Television for partnering with us. Casino Cosmopol is the official tour partner in Sweden of Scandinavian Gaming Inc.
Come with us to Scandinavia and tour this beautiful part of the World and have a great vacation with Scandinavian Gaming Inc. The Stockholm Royal Palace, Casino Gaming and Sightseeing Tour * * * *: Scandinavian Gaming Inc. is proud and honored to offer a unique program in Stockholm Sweden. Our company has initiated a special program with the Royal Palace of Sweden located in Stockholm. 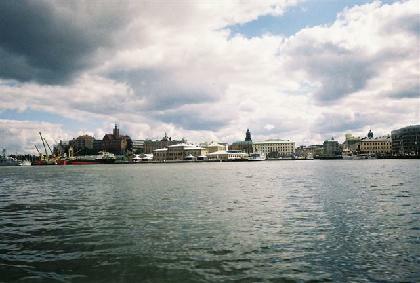 Therefore our company would like to offer a fantastic and exciting program that includes 7 nights in Stockholm Sweden. This package includes a tour of the Royal Palace of Sweden in Stockholm, Europes biggest Royal Palace where our guests will be viewing some of its 600 rooms. While at the Royal Palace our guests will be seeing the Royal Treasury where all of the spectacular and priceless Royal Crown Jewels of Sweden are kept. 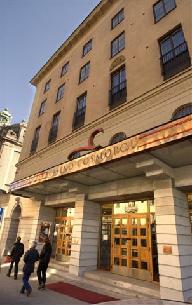 In addition we supply fantastic lodging and breakfast at one of the 7 hotels we have available in Stockholm. A free entry into Swedens Casino Cosmopol with a main course meal at its fantastic restaurant and a special gift from the casino are also a part of this package. In addition enjoy a cruise thru the scenic Stockholm canals and waterways and into the beautiful Stockholm Archipelago Islands around Fjaderholmarna when the cruise is open and operating during the spring and summer season 2008. With this package you will also receive a siteseeing bus tour of Stockholm where you will be seated in a special glass enclosed bus and you will be shown all of the city of Stockholm's most famous sites. 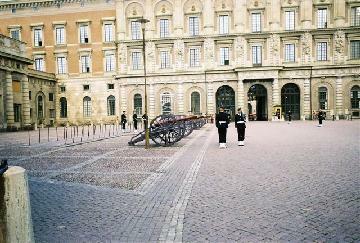 Please contact us for the 2008 cost of this package for our luxury hotel located near the Royal Palace of Sweden. Summer Special : Stay 9 minutes from the center of Stockholm at a new hotel facility with this summer time special and enjoy the Royal Palace tour (as above), the casino package (as above) and a special boat cruise adventure out to Lidingo and the Stockholm Archipelago Islands surrounding there. In addition we will add a sightseeing bus tour of the city of Stockholm in a specially built glass enclosed sightseeing bus thru the city streets of Stockholm that will show you Stockholms best sites Please contact us for the 2008 Summer Special Price for the Royal Palace- Casino- Lidingo & surrounding Archipelago Islands Cruise and glass enclosed bus siteseeing tour package. Norwegian Fjord Adventures: Scandinavian Gaming is proud to offer tours to Oslo, Norway and to Flam, Voss, Gudvangen, Stavenger and Bergen, Norway to the beautiful Fjords of Norway. The Hardangerfjord Adventure: Our guests can also explore the third largest fjord in the world, the beautiful Hardangerfjord. The Hardangerfjord is 114 miles in length from the Ocean to the interior of Norway and is the second longest fjord in the country. The Hardangerfjord adventure starts in Oslo where our guests will stay at one of our friendly Norwegian Hotels for one or two nights in Oslo, from there you board a very beautiful and scenic train ride for 6 1/2 Hours to Bergen gateway to the Fjords of Norway. You will enjoy 2 nights in Bergen exploring this city and its surroundings before departing to Norheimsund by Bus. Then travel from Norheimsund across the beautiful Hardangerfjord with its majestic mountains to Eidfjord by boat. From there you will take a boat from Eidfjord to your hotel in Ulvik which is located on the fjord and stay 3 nights in Ulvik. During your time in Ulvik you can explore this magnificent area of picturesque beauty. After your stay in Ulvik you take a scenic bus ride to Voss and from Voss you board a train back to Oslo. We also have numerous other cities in Norway our guests can visit. We have a number of different tours from Oslo that may include trains, busses, ferrys and boats to and thru the beautiful Fjords of Norway. These packages are available to individuals and groups and include lodging in Bergen and or Oslo Norway and numerous other Fjord locations and transportation from Oslo to and thru the fjords and back to Oslo. The 7 day Hardangerfjord Adventure includes 7 nights lodging. 2 nights In Oslo, 2 Nights In Bergen and 3 Nights in Ulvik Norway plus the trains, boats and busses described above and breakfast at the hotels. Double Occupancy 2 people in a room and single occupancy are priced per person. Children under 15 staying in their parents double room is additional. Extra Nights are available at each Hotel by request. Hotel Upgrades are available. The Hardanger Fjord Adventure is available from May thru Sept 2008 Please contact us for pricing on this adventure. The 16 Night Ultimate Norway Fjord Vacation The ultimate fjord vacation is a 16 night fjord adventure that starts in Bergen Norway the gateway city to the fjords and Norway's second biggest city and combines the two most beautiful fjord sightseeing adventures in Norway into one ultimate fjord vacation. You will spend 6 nights in Bergen where you can experience the city on your own and see its fantastic fish market and taste the seafood which is delicious. Bergen has a thriving night life and has one of the worlds most beautiful vistas from the top of the cities cable car which is magnificent to see. You will be staying in a very comfortable hotel with a Scandinavian style buffett breakfast served everyday. The city is full of restaurants and bars and outdoor cafes to visit. 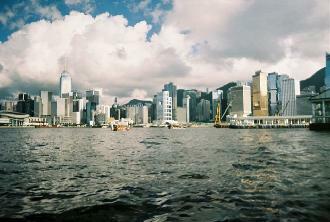 The city is located on a harbor and has many different types of boats and sailing vessels to see. Your first fjord experience will be to take the train from the Bergen station to Flam (via Myrdal) and see this small town located on the fjord. In Flam you will meet your fjord ferry that takes you on a cruise thru beautiful scenery of mountains meeting water and small Norwegion villages to the Naeroyfjord. The Naeroyfjord is a World Heritage Site as its just incredibly awesome to view as it is Norway's narrowest fjord. After passing thru the fjord you arrive in Gudvangen to catch your bus to Voss. This is a spectacular bus ride as you stop at the top of one of the mountains to see a view of Norway that is astounding. Your bus ride continues until you reach the village of Voss a winter time ski town. Here in Voss you should stay to see the town briefly as its worth taking a walk thru this neat little town with its beautiful lake and mountain surroundings. After seeing Voss you catch a train back to your hotel in Bergen. After 5 nights in Bergen your journey thru the Hardangerfjord and your stay in Ulvik Norway begins. 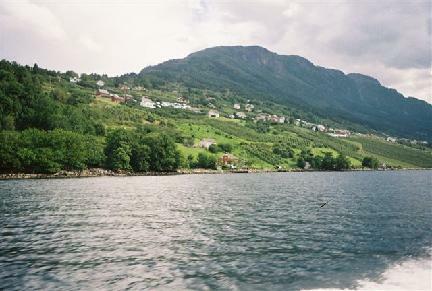 You depart Bergen for Voss by train where you will meet your bus to Ulvik. Ulvik is a small town located on the Hardangerfjord and the perfect place to just relax for a few days. There isn't much in Ulvik except the beautiful surroundings of mountains and water as Ulvik is a pretty small Norwegion village. Bring your fishing rod and your favorite lures if you like to fish as this could be one of the most relaxing places on earth to unwind. 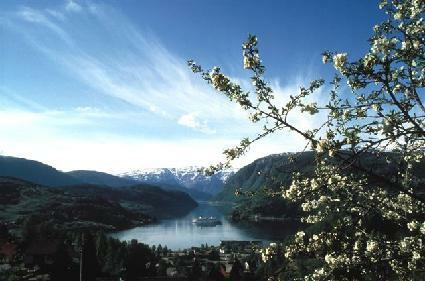 Ulvik is beautiful with its apple, cherry and plum orchards. There are wild rasberries here that the kids will enjoy picking and eating and if you take a day trip to the vast and endless Hardingvidda National Park near Eidfjord the wild blueberries you can pick there are delicious. Ulvik is quiet, its peaceful and it does have a couple of restaurants and bars for nightlife. This is a vacation to forget about your stress and just relax for 10 days. You can hike, fish and take a boat into the fjord in Ulvik. The boating thru the fjords is spectacular with the most incredible views everywhere you look and your kids if you take your family along will just love it. After spending your days here you will take a boat to Eidfjord a small town located across the fjord and from there take a long cruise thru the Hardangerfjord to Norheimsund where you will meet your bus for a ride back to Bergen. You will stay one more night in Bergen before departing. The Ultimate Fjord Vacation Includes 16 Nights Hotel with breakfast every day. 6 nights in Bergen Norway and 10 nights in Ulvik Norway, 3 trains, 3 scenic busses, and 3 fjord boat cruises. Please contact us for 2008 Prices. 9 Night Oslo & Voss Norway Naeroyfjord Adventure * * * * This fjord vacation is a 9 Night package that includes 4 Nights in Oslo and 5 Nights in Voss Norway with breakfast everyday and also includes a 1 day Fjord adventure and cruise thru what has been called the most beautiful scenery in all of Europe. The fjord sightseeing adventure starts in Oslo where you can see Norways capital city on your own. 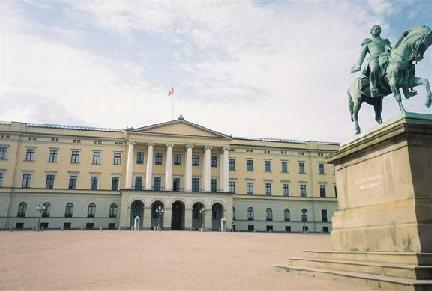 Here in Oslo you will be staying near Oslo's main street (Karl Johan Street) and Norway's Royal Palace where you can walk the grounds of the gorgeous Royal Palace Park and tour this magnificent building if its open (The Royal Palace is open in July and part of August for tours of the interior). After 3 nights in Oslo you will depart by train from Oslo to Flam (via Myrdal) a small scenic town on a waterway that connects with the Sognefjord. From there you catch a ferry across the incredibly beautful Naeroyfjord a world heritage site to Gudvangen. In Gudvangen you will board a bus for an incredible journey thru mountain passes of astounding beauty to the extremely scenic and picturesque Voss. Voss is a ski town located between Norways most famous fjords. Here in Voss you can fish and take river rafting rides in some of the 500 lakes and rivers that are in the vicinity of Voss. The town of Voss is surrounded by beautiful mountain vistas everywhere. Tennis is available at your hotel along with staying in a great little ski town that has a cable car available for skiing in the winter and sightseeing from the top of the mountains in both the winter and the summer. 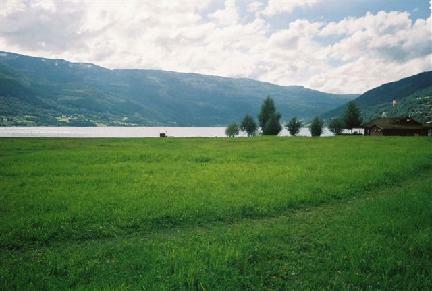 Hiking is a favorite activity in Voss as the town is situated on a beautiful lake. While staying in Voss you can take day trips on your own to explore the surrounding mountains and lakes, Visit Bergen Norway's second biggest city or revisit the fjords as Voss is a strategically placed jumping off point for visiting that area of Norway. 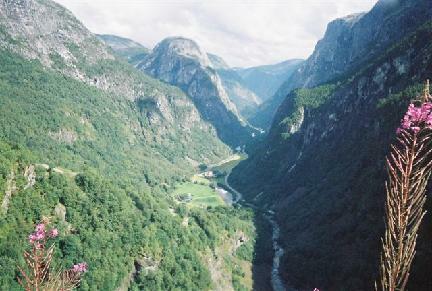 From Voss you depart back to Oslo by Train for 1 night at your hotel. 9 Night Package : Includes 9 Nights Hotel with breakfast every day (4 Nights in Oslo and 5 Nights in Voss), Voss Fjord sightseeing adventure (2 Trains, Bus and Ferry) Extra Nights and Hotel Upgrades Available. This tour operates all year round unless their is ice blocking the fjord. Available all year 2008 except Holidays. Please contact us for 2008 Prices. The Nordic Spas Retreat: This is the ultimate vacation for the people who just want to be pampered in a special way that only the people from the Nordic countries can do. With this package you will visit 3 countries: Iceland with its Blue Lagoon Geo Thermal Spa. Arvika Sweden with its spa originally established in the 1800's with its welcoming atmosphere that has been carefully maintained and your choice of 3 different spa locations in Finland where their are fabulous spas located for you to be pampered, soothed, jacuzzied or sauned. For the ultimate in Nordic relaxation treat yourself to the ultimate in pampering, you deserve it. Please contact us for more details and pricing of this package. Transportation between countries and spas is not included. 22 Night Spectacular Norwegian Land and Sea Vacation: Start this great vacation in Bergen Norway spending 2 nights in Norway's second largest city. While here you must take the cablecar on your own to see the view from the top of Bergen as it is incredible. Also dont miss the fishmarket as the seafood is delicious. After your stay here you will board a ship as you begin a cruise that stops in 34 ports of call along Norway's western coast and up to the Arctic and towards the Russian Border. This trip is spectacular as the scenery is fantastic on the route. Along the way you will spend 11 nights on board the ship as you head to Kirkenes before returning to Bergen. 11 nights will also be spent in hotels at stops in the 5 different ports of Trondheim: Norway's third largest city where you can visit Konge Lige/Stiftsgarden the home of the Norwegian King when he is in Trondheim, Tromso: the capital of Northern Norway which is also called the Paris of the North, Svolvaer: a modern port town located on the northenmost island in the incredibly beautiful Norwegian Archipelago and Kirkenes: located near Russia in the Artic. Their is a great hotel waiting for you in each location where you will enjoy breakfast and can explore each town on your own as you spend 2 nights in each port town before reboarding a ship to continue your cruise. If you want to see the real beauty of the world and spend a little time doing it this trip is for you. 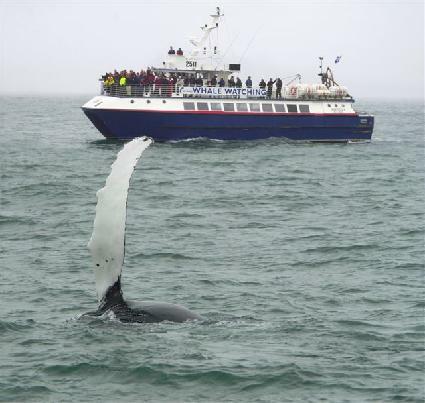 As you spend 11 nights cruising and 11 nights on land sightseeing Norway's beautiful waterways, towns and Coastline. If you enjoy cruises and want to do some sightseeing in some great Norwegian town locations this is the trip for you. When your ship docks in Bergen after the cruise you will enjoy 1 more night in Bergen with breakfast at a great Bergen hotel. 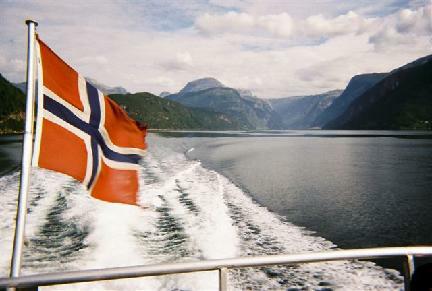 Please contact us for pricing for this spectacular Norwegian adventure that is available all year round in 2008. 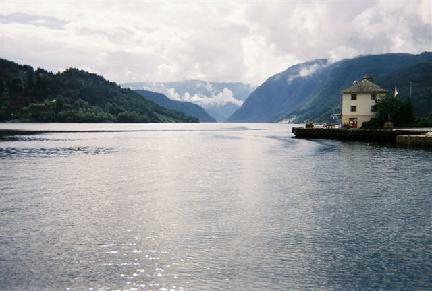 Enjoy a fantastic stay next to the water in the beautiful fjord town of Flam Norway. For more information on staying in this beautiful fjord town with its majestic surrounding mountains and gorgeous blue waters please contact us. Relax in Ulvik Norways splendid beauty and gorgeous Fjord with its deep blue waters and snowcapped mountains. 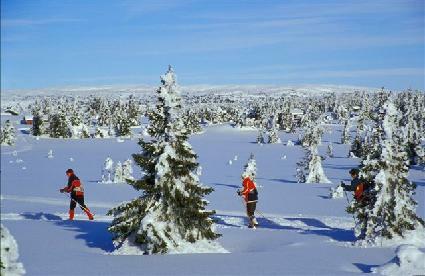 Summer Snow Skiing: Summer snow skiing on the glaciers near Ulvik can be arranged. Please contact us for information and pricing. Oslo Norway Fjord and Gothenburg Sweden Casino Gaming Tour : Experience some of the worlds most beautiful scenery on this tour to Norway and Sweden. Start your tour in Oslo Norway where you will spend 3 nights at a beautiful hotel and your days exploring the Capital of Norway. Here you can visit the Viking Ship museum with its 1000 year old Viking Ships. While in Oslo visit the Holmenkollen Ski Jump site of the 1962 Winter Olympics with its Ski museum located there. In your spare time take a walk on Karl Johan Street Oslo's main street past Norway's Parliament until you reach the Royal Palace of Norway where you are allowed to walk on the grounds and tour the Royal Palace which is the Residential Palace of the KIng and Queen of Norway (Open from June 24th to August 13th 2006 and the tour of the Palace is included when available). After touring the above areas on your own you will board a train to visit one of the worlds most beautiful areas. You depart by train from Oslo to Flam Via Myrdal. Flam is a small town located on waterways that connects with the Sognefjord the worlds longest fjord. 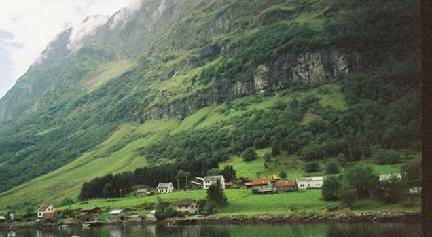 From Flam you travel to Gudvangen. Here you will be in the center of the Naeroy area. 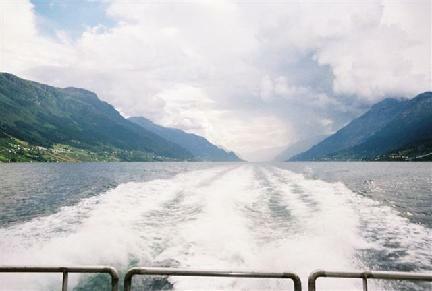 The Naeroy Fjord is the worlds most narrow fjord. From there travel to Voss by bus. 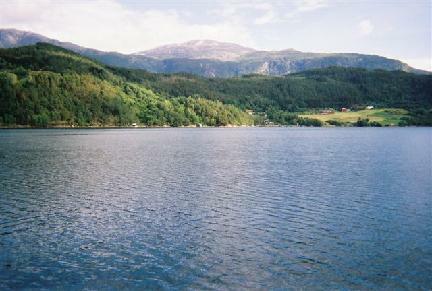 Voss is situated between Norways most famous fjords and is exstremely picturesque. Here you will stay in Voss for 1 night. You will then depart Voss for your train ride back to Oslo. You depart Oslo on your own to Gothenburg Sweden where you will spend 3 Nights of fun exploring Gothenburg. 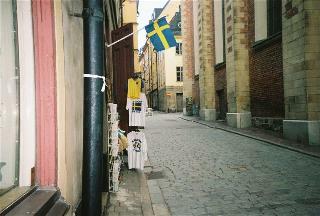 While in Gothenburg you can tour the town on your own as Gothenburg is Swedens second largest city. 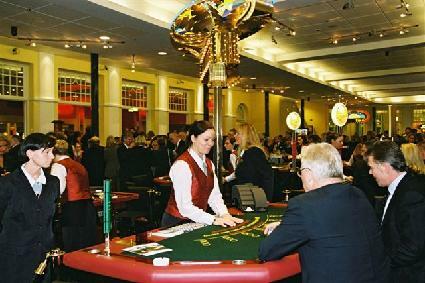 Our guests will be treated to a free entry into the Gothenburg casino. The Gothenburg casino will serve one fantastic lunch or dinner to our guests and while at the casino they will also receive a special free gift. The Casino restaurant has been named one of the top 5 restaurants in the city. Gothenburg is home to the largest port in all of Scandinavia and the Liseberg Amusement Park. 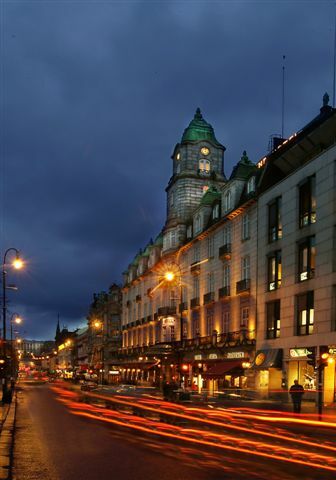 This Tour includes 3 Nights Hotel accommodations with breakfast everyday in Oslo Norway. 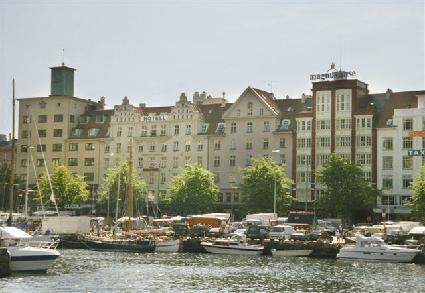 3 Nights Hotel accommodations with breakfast every day in Gothenburg Sweden. 1 Night Hotel accomodations in Voss Norway, a Fjord sightseeing adventure to Voss Norway including 2 trains, bus, and ferry to and thru the fjords. Free Entry into the Casino. Lunch or Dinner at the Casino's restaurant and a free gift from the casino. Please contact us for pricing on this trip. 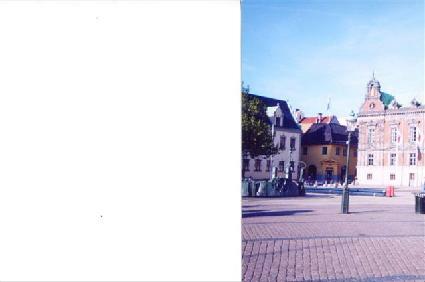 Tour does not include airfare or transfers between Gothenburg Sweden and Oslo Norway. Extra Nights are available upon request. Norway is an incredibly beautiful country and Scandinavian Gaming Inc. has 67 Hotels that we are partnered with to stay in and sightsee at in this friendly beautiful nation. Visit Norway with Scandinavian Gaming Inc. and stay in one of our great locations like the one pictured to the left in Oslo. 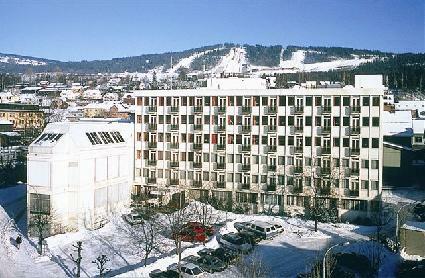 While staying here in the winter you will have excellant skiing located nearby at the site of the 1952 Oslo Winter Olympics. Skiing is a geat winter activity, a lot of fun and fantastic exercise so come with us and try Norway's skiing and remember this is where skiing originated from. Copenhagen Denmark Royal Crown Jewels Tour: Enjoy a visit to Copenhagen, Denmark with Scandinavian Gaming Inc. Our tours to Copenhagen include a great Hotel room for as many nights as you would like to stay in Denmark. As part of the Copenhagen package our guests will receive a pass to tour Copenhagen's Harbor area and also receive a tour to view the country of Denmarks Royal Crown Jewels. A visit to the World Famous Tivoli Gardens Amusement Park is also included. For this special program occupancy may be limited and payment in advance must be received before a confirmation of the booking will be given during some time periods. Once this program is paid for no cancellation of this program is available within 40 days of travel. 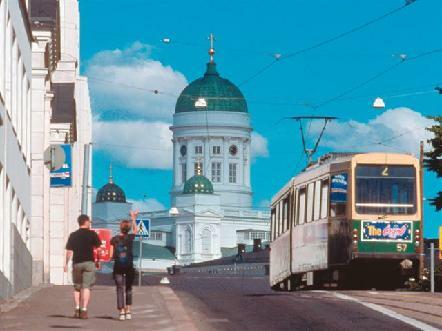 Helsinki Finland Tours: Come with Scandinavian Gaming Inc and view beautiful Helsinki Finland. Our tours to Helsinki include a terrific hotel room in the center of Helsinki at our tour partners hotel. Our guests also receive a guided tour or audio tour by bus thru the city of Helsinki which includes a view of Helsinki's Presidential Palace, City Hall and The Parliament Buildings. In addition Scandinavian Gaming wants you to see the real Finland therefore we have added a tour to Nuuksio National Park . This Finnish National Park has 38 Lakes and Ponds in the Park in which you can take a quick swim. Lots of Berries and mushrooms grow wild in the park in the summer and fall. Also while in the park you may see a lot of wild birds, moose, and deer. A visit to an old Finnish wooden town with its local shopkeepers is also available. Add this city to our other major cities and you have our Scandinavian Gaming Inc. Capitals tour. Our tours are unescorted leaving you the freedom to see each city as you wish and having the freedom to spend as much time as you want in each place you visit in Scandinavia. Please call us for pricing on the Scandinavian Gaming Capitals Tour. Scandinavian Gaming presents this Royal Danish vacation that includes accomodations located very close to the Royal residence. A Scandinavian breakfast every day. A visit to see the Royal Danish Crown Jewels. 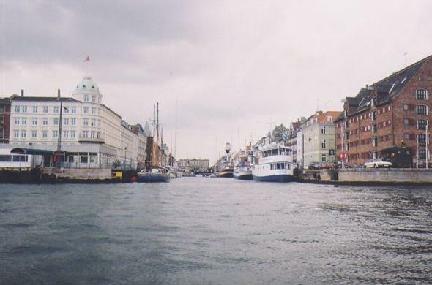 A tour of Copenhagens Harbor and a free entrance to the health club located around the corner from the hotel. 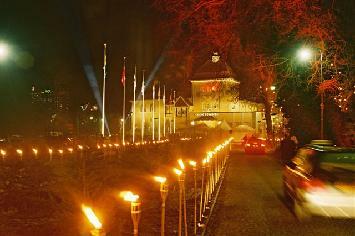 Plus an entrance to the World Famous Tivoli Gardens Amusement Park when the park is open. ( Opens approximately the 2nd week of April - Closes approximately the third week of September ). Available all year 2008. Prices subject to change. 5 Night Helsinki Finland Package: Spend 5 nights in Helsinki in a very comfortable hotel with breakfast served every day. During your time in Helsinki you will take a tour of the city of Helsinki on a guided tour bus where you will be able to see the Presidential Palace, City Hall, The Parliament Buildings, Finlandia Hall and other places of interest in Helsinki.. Our guests will also visit Finland's Nuuksio National Park in its natural state with its 38 lakes and ponds and wild berries, moose and deer. In addition tour the old wooden town of Porvoo. Dates Available: June 12th thru Sept.14th 2008 Extra Days Available. Please contact us for pricing. 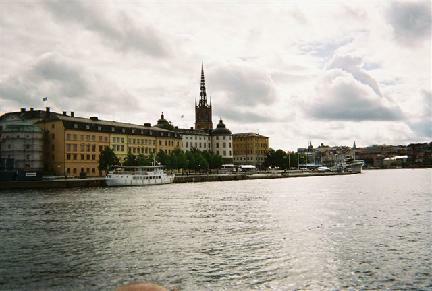 11 Night Stockholm Sweden and Helsinki Finland Tour: * * * * Enjoy a weekend in Stockholm and a week in Helsinki. On this tour spend Friday, Saturday and Sunday nights in Stockholm. On Monday night cruise on a ship thru Stockholm's 32000 Island Archipelago and the Baltic Sea to Helsinki Finland and then spend 7 nights in Helsinki Finland. 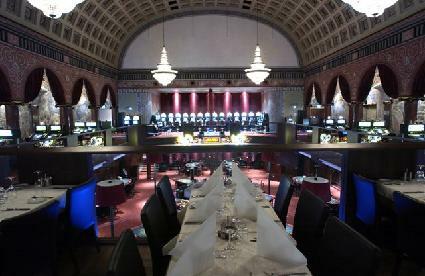 Included on this trip are a free entry into the Stockholm Casino where you will enjoy a fantastic lunch or dinner and be given a free gift from the casino. An interior tour of Stockholms 600 room Royal Palace of Sweden and a view of the spectacular Swedish Royal Crown Jewels are a part of this great package. 3 weekend nights (Fri, Sat & Sun ) in Stockholm at one of Stockholm's best hotels with breakfast served everyday, an all night cruise thru the Baltic Sea aboard a cruise ship from Stockholm to Helsinki, 7 nights hotel with breakfast in Helsinki Finland and a guided bus tour of Helsinki to see the city and its sights including a view of the Presidential Palace of Finland are all also included. This package for the 11 nights costs: $2605 double occupancy per person and $3359 single occupancy. Available all year 2008 except holidays. Arrival must be on a Friday in Stockholm Sweden. Prices subject to change. Scandinavian Tri City Luxury Tour: Oslo, Copenhagen, Stockholm This tour is an unescorted tour of Oslo Norway, Stockholm Sweden and Copenhagen Denmark. With this tour stay in our nicest hotels in 3 of Scandinavia's nicest cities. Tour includes: 4 nights in Stockholm , 4 Nights in Oslo and 4 Nights in Copenhagen. In Oslo sightsee with our incredibly beautiful Voss Fjord Day Tour and be treated as though you are a Noble Prize Laureate and see where the Noble Peace Prize Ceremonies are held. Visit the Royal Palace of Norway and take a tour of this incredible Palaces official rooms. 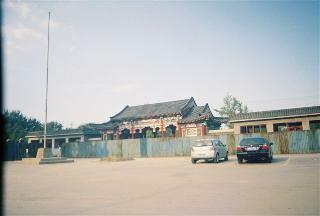 (Available late June to Early August 2008). While in Copenhagen be treated like Royalty with our Danish Royal Crown tour and Boat tour of Copenhagens Harbor. In Stockholm enjoy a free entry into the Stockholm casino and a great meal at the Casino's restaurant and be a High Roller if you wish. While at the casino you will also receive a special free gift. You will definately be treated as though you are the King as you tour the Country of Swedens Official Royal Residence, The 600 room Royal Palace of Sweden. Breakfast is included every day Cost for this Vacation Package For 12 nights is: $4473 Single Occupancy 1 person in a single room : Double Occupancy $3498 Per person (2 people in a room only) Available all year round. Airfare and any transfers are not included. This Tour is available for individuals or groups. Extra nights available upon request. If you wish an overnight cruise between Oslo Norway and Copenhagen Denmark can be added at an additional cost. Available all year 2008. Prices are subject to change. 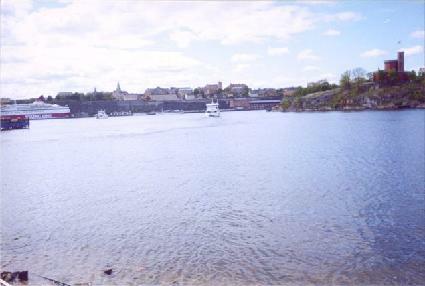 View Stockholms waterways and large castles. 14 Night Stockholm and Gothenburg Sweden Gota Canal Cruise: Have a great vacation as you spend 5 nights in the city of Stockholm, 4 nights in the city of Gothenburg and 5 nights on a ship as you cruise between these 2 cities thru the center of the country of Sweden. The Gota Canal has a total length of 190 km and is made up of 103 km of natural lakes and rivers and 87 km of man-made waterways and is a passageway through Sweden linking the North Sea and the Baltic Sea and Sweden's East and West coast. On this tour you will be able to see a large part of Sweden with its beautiful lakes and countryside as you travel between Sweden's east and west coast. Drottningholm Palace The residence of the Royal Family can also be seen while on this tour. 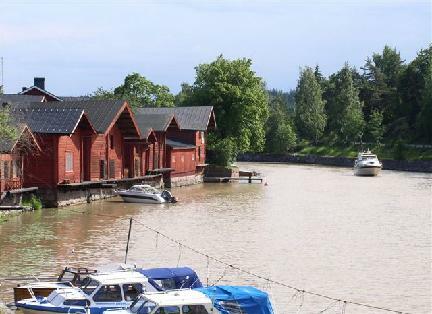 This is a fantastic way to see the countryside of Sweden as you will have 11 stops of varying duration along the cruise route.Tours Available May 17th thru Sept 18th 2007. Included in this package are 5 nights on board your ship with five breakfasts, six lunches and 5 dinners, Scandinavian Breakfast every day in your Stockholm Hotel with 5 Nights accommodations, 1 dinner or lunch at the Stockholm Casino with a free entry and a special gift plus 4 nights hotel accommodations with a Scandinavian breakfast each day in Gothenburg. Please contact us for 2008 Prices. 14 Night Scandinavian Tour: Visit the countries of Finland, Denmark, Sweden and Norway: Spend 3 nights in Helsinki Finland, 3 nights in Stockholm Sweden, 3 nights in Malmo Sweden and 3 nights in Oslo Norway along with 1 night on a cruise ship between Helsinki and Stockholm and 1 night on a ship between Copenhagen Denmark and Oslo Norway on this 14 night Scandinavian tour. A Scandinavian breakfast will be included at each hotel. A tour of the 600 room Royal Palace of Sweden in Stockholm is included. A special dinner package at Casino Cosmopol Malmo plus a special gift from the Swedish casino is also included in this package (20 years and older only for entry-passport required for identification). In Oslo you will be staying near the Royal Palace of Norway so you can take a walk thru the Royal Palace Park and see the Royal Palace while there. Malmo Sweden is located 20 minutes from Copenhagen Denmark where you will board your ship for a beautiful cruise to Oslo Norway.Transportation between Stockholm and Malmo and Malmo and Copenhagen are not included. Please contact us for pricing on this trip. 14 Night Malmo Sweden - Oslo Norway Adventure: * * * * Enjoy two great weeks visiting Malmo Sweden and Oslo Norway and their respective areas. You will receive 7 nights accommodations in Malmo Sweden with a Swedish smorgasbord breakfast everyday plus two special nights out at the Casino Cosmopol Malmo which include free entry into the casino with dinner and a special free gift from the casino on each visit (20 years old and older only- Passport required for identification). After spending your time in Malmo you will depart by cruise ship from Copenhagen Denmark for your beautiful overnight scenic journey along the coast of Sweden to Oslo Norway. A buffet dinner and breakfast will be served on the ship. 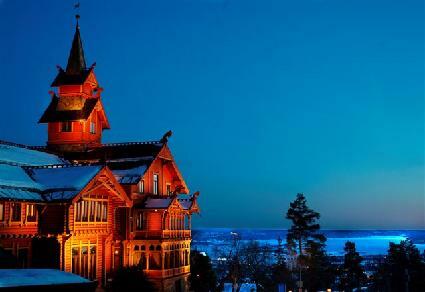 In Norway you will be staying in the city of Oslo for 6 nights with breakfast served every day. Malmo Sweden is a great jumping off point where you can visit on your own beautiful Copenhagen and Helsingor Denmark home of Hamlets castle and also Lund and Helsingborg Sweden all with in easy reach of Malmo by train for a daytrip. Oslo is a great jumping off point to visit Marka Oslo's forest for hiking, bike riding, skiing, fishing, wildberry picking and jogging paths. Marka has 343 lakes, 310 miles of ski trails and 24 ski jumps and alpine slopes within its boundries to explore during your stay in Oslo. From May to Sepetember you can also cruise on your own the Oslofjord with its 40 islands in the immediate surrounding archipelago and visit numerous small towns and villages. You will be staying near Slottsparken the Royal Palace of Norway's Park where you can see the daily ritual of the changing of the guards at Norway's Royal Palace. The Malmo Sweden - Oslo Norway 14 night adventure includes 7 nights accommodations in Malmo Sweden with Swedish smorgasbord breakfast, 2 nights casino dinner package in Malmo, Overnight sightseeing cruise ship from Copenhagen Denmark to Oslo Norway with dinner buffet and breakfast and 6 nights fantastic accommodations located close to the Royal Palace of Norway with breakfast everyday. Cost: $3100 US dollars per person double occupancy $4200 US dollars per person single occupancy Available all year round 2008 except holidays. Prices subject to change. If your interested visitors can visit the cities of Malmo, Goteborg, and Sundsvall, Sweden and the casinos located in each of those cities and enjoy a free lunch or dinner at the casino when gambling at the casinos tables before or after sightseeing the beautiful cities and countryside of Sweden. The Malmo Casino is a glorious building and is in the picture to the left. Malmo Sweden Casino Package Includes: A Luxury Hotel Room with breakfast at the hotel, Free Entry into Casino Cosmopol Malmo, a delicious lunch or dinner at the Malmo Casino's restaurant and a special free gift from the casino every day Price: Summer Season from 6/18-8/18 2008 Single for 1 person $244 per person per night Double Room(For 2 People Only) $199 Per person per night All other dates 2008 : Single Room (for 1 person only) $299 Per person per night Double Room (for 2 people only) $225 Per person per night. Enjoy Delicious Dinners or Lunches at the Casino's restaurants. The Stockholm Sweden Casino's Restaurant is pictured here. Gothenburg Sweden Casino Package Includes: A very comfortable hotel room with buffett style breakfast at the hotel, Free Entry into Casino Cosmopol Gothenburg each day, a delicious Lunch or Dinner every day at one of the Casino's Restaurants and a special free gift from the casino each day. Summer rates from 6/18 - 8/18 2008 Single Room for 1 Person $249 Per Night Double Room (for 2 people only) $199 Per person per night All dates the rest of the year 2008: Single room for 1 person $279 Per person per night Double room (for 2 people only) $221 US Dollars Per person per night. After enjoying a great lunch or dinner our guests can try their luck at the black jack tables and try and beat the house. The minimum age of any entrant into all of the Swedish Casinos is 20 years old. 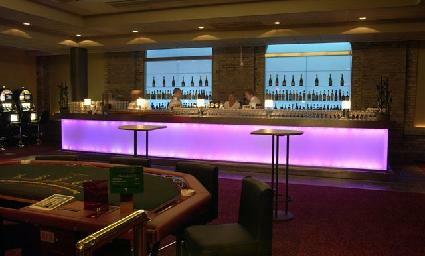 Helsinki Casino Package: The Helsinki Casino is the only casino located in the country of Finland. The casino has 30 Table Games including roulette, black jack, oasis poker, sic bo, punto banco and 5 different poker games along with 300 slot machines located within the casino. This package includes hotel with breakfast, an entry into the casino , a taste of Finland meal and a show. Casino packages available all year round please contact us for more information on the shows available and pricing for this gaming package. The Scandinavian Royal Palace Tour: This tour thru Scandinavia visits the grounds or tours the Royal Palaces, Royal Crown Jewels, and Presidential Palaces of the Scandinavian Countries. Spend 4 nights in Oslo Norway, 4 nights in Stockholm Sweden, 4 nights in Copenhagen Denmark and 4 nights in Helsinki Finland. On this tour you will be treated like Royalty. In Oslo you will walk the grounds of The Royal Palace of Norway located at the end of Karl Johan Street Oslo's main street. 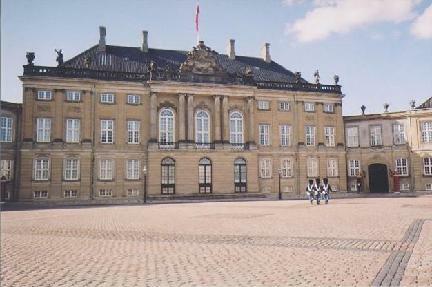 The Royal Palace of Norway's interior tour is available briefly during the summer in 2007. During your stay in Oslo you have the opportunity to visit numerous sightseeing areas of the city and Norway. On this tour you will visit The Royal Palace of Sweden in Stockholm. Here you can walk the halls of the Royal Palace with its 608 Rooms. The Royal Crown Jewels of Sweden are located at the Palace and can be seen here. You will enjoy the changing of the Royal Palace Guards if you time your visit to coincide with this event. 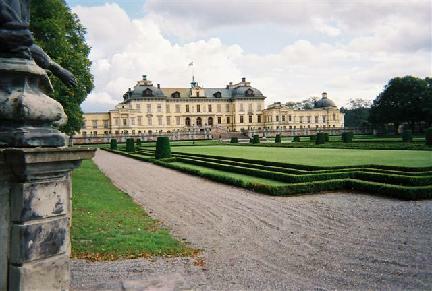 While in Stockholm you will also take a boat cruise thru the beautiful waterways of Stockholm to Drottningholm Palace (when available) this Palace is the Royal Families Residence and the grounds of the Palace are beautiful. This tour will also take you to Helsinki Finland which is the last city you will visit on the tour by overnight cruise ship from Stockholm through the magnificent and scenic 32000 Island Archipelago where you will enjoy a fantastic dinner onboard the ship. In Helsinki you will board a tour bus that takes you on a guided tour of the city to see the cities best sites and where you can see Finland's Presidential Palace. On this tour you can view the Presidential Palace's exterior but can not enter it. On some occasions a tour inside of the Palace may be available for groups. The Scandinavian Palace Tour begins in Copenhagen Denmark. 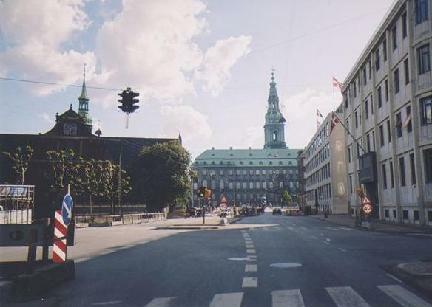 In Copenhagen Denmark you will stay very close to the Royal Palace Residential area. You will be given a special pass that allows you to go inside the building that houses Denmarks Royal Crown Jewels and see upclose The Danish Royal Crown Jewels of Denmarks Monarchy. 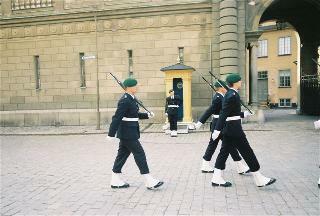 You can also see the changing of the guards ceremony in Copenhagen. After your visit in Copenhagen you will take an overnight cruise ship to Oslo Norway where you will be served both dinner and breakfast onboard as you view the beautiful coastlines of Denmark, Sweden, and Norway from the ship. This Package Includes: 4 Nights hotel in Oslo Norway with breakfast each day and a pass to view the interior of the Royal Palace of Norway when it is open. 4 Nights hotel in Stockholm Sweden with breakfast each day. Our guests will receive a pass to get them inside the Royal Palace of Sweden to view all of its Royal Splendor and receive a boat cruise to Drottningholm Royal Palace. 4 nights hotel in Copenhagen Denmark with a Scandinavian breakfast each day. A pass to visit and view the Danish Royal Crown Jewels of Denmarks Monarchy. 4 nights hotel in Helsinki Finland and a Bus tour of Helsinki that includes a view of the Presidential Palace. 2 overnight cruises that travel between Stockholm Sweden and Helsinki Finland with dinner onboard and Copenhagen Denmark and Oslo Norway with breakfast and dinner onboard. Transportation between Oslo and Stockholm is not included. Price for this trip is: $4499 Single occupancy per person and $3379 Double occupancy per person. Available all year 2008 except holidays. Prices subject to change. Fishing Tours: Fishing tours are available for everyone. 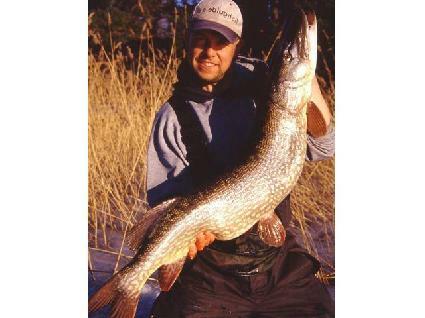 In Stockholm you can fish for Pike that weigh up to 25 lbs. and Atlantic Salmon that weigh up to 70 lbs. Fishing in the Fjords of Norway for Trout and Salmon is an incredible outdoor adventure that is spectacular. Please contact us for details on arranging a fishing trip to Norway or Sweden. 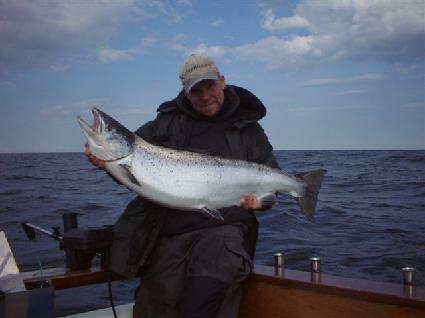 Huge Atlantic Salmon can be caught in the Baltic by our guests as we have fishing guides available who are ready to take you fishing on their charter boat if you are interested in trying to catch that once in a lifetime big Salmon. 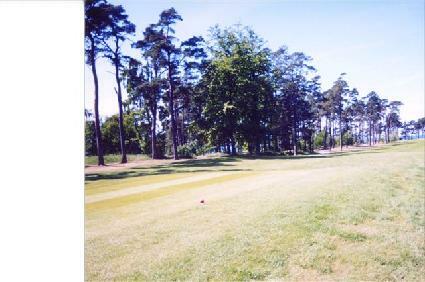 Play a round of golf at one of Stockholms beautiful golf courses. If you are visiting Malmo, Sweden try teeing off from the tee box pictured here on one of the holes of the famous Barseback golf course located just outside the city of Malmo. 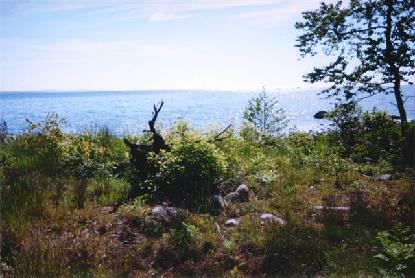 From the tee you can look down the fairway towards Denmark that is located just across the water. Group Golfing Tours: Group Golfing and Casino packages are available to the Malmo Casino and the World Famous Barseback Golf Course which has played host to the Womens Solheim Cup. Please contact us for details. You can even just take a little time to be by yourself in the beautiful countryside of Sweden and just do what you went on vacation for relax and take in the beautiful scenery of the coast of Sweden. 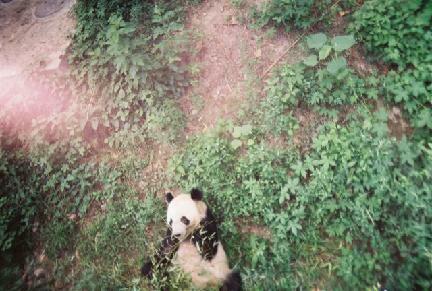 Group Tours: Group tours (25 people or more) are available for any of the packages listed on this site. Group tours can be custom made to suit your groups interests. Group Tours To Stockholm Sweden These groups will enjoy our sightseeing tour of the greater Stockholm area for a great view of the city. Round trip transportation on our busses from the airport to the hotel is included. We will use our busses to transport the group to the tour sights when applicable. Groups will enjoy a free entry into the Casino and be served a delicious lunch or dinner at the Casinos restaurant for a specific number of days agreed upon by the group.. Breakfast will be served at the hotel. 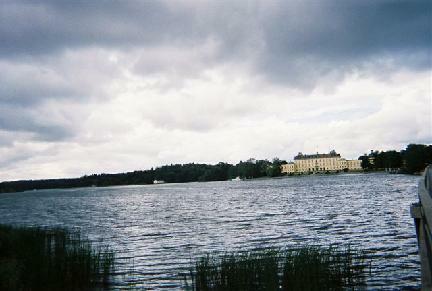 Groups will receive a tour of the Royal Palace of Sweden in Stockholm and other Royal Palaces if they choose to do so. 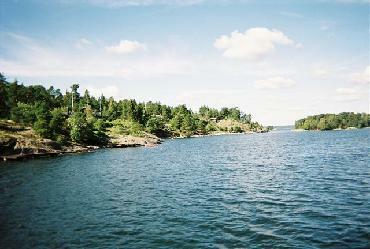 Groups can visit Swedens National Parks or museums including the Noble Prize Museum. Group Leaders will receive a free room and breakfast at the hotel at most of our Norwegion and Swedish locations. Please contact us to custom make a group tour for your group. Scandinavian Gaming Inc has partnered with over 100 different Hotels thruout Scandinavia and has numerous other partners including airlines, bus companies and boat tour operators that are working with us in special relationships. We custom build our tours for groups and individuals so that our customers go where they want, see what they want and do what they want at the times that are the most convenient for them. Group Leaders who want to plan a custom itinerary or use one of the trips above for their groups to visit Scandinavia or other location please contact us thru the feedback area at the bottom of the page. Scandinavian Cities Where Hotel Rooms Are Available: Scandinavian Gaming Inc. has hotel rooms available in over 85 locations in Scandinavia. We can build packages for leisure travel to any of the following cities in Scandinavia: Hotels located in Norway, Finland, and Sweden (Except Stockholm) are designated for leisure travel. In Norway the following locations are available: Alta, Beitostloen, Bergen, Bodo, Dombas, Drammmen, Elverum, Fauske, Floro, Forde, Gol, Grimstad, Hamar, Hammerfest, Harstad, Haugesund, Honningsvag, Karasjok, Kirkenes, Kristiansand, Kristiansund, Lillehammer, Mo I Rana, Molde, Morgedal, Nordfjordeid, Nusfjord, Oslo, Roros, Sandefjord, Sandnessjoen, Sarpsborg, Skien, Stavanger, Svalbard, Svolvaer, Tjome, Tromso, Trondheim, Tonsberg, Ulvik, Vadso, And Alesund. In Sweden leisure packages can be built to the following cities and towns: Arvika, Goteborg, Helsingborg, Hemavan, Hudiksvall, Karlstad, Malmo, Riksgransen, Skelleftea, Stockholm, Stromstad, Soderkoping, Umea, Visby and Orebro. 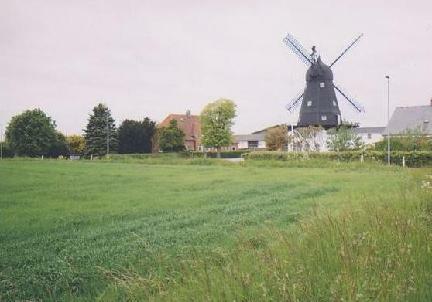 In Denmark Copehagen is available to visit. In Iceland Rekjavik is available. In Finland Helsinki, Helsinki/Vantaa airport, Hyvinkaa, Hameenlinna, Imatra, Jyvaskyla, Kemi, Kotka, Kouvola, Kuopio, Lahti, Lappeenranta, Mikkeli, Oula, Pori, Rauma, Rovaniemi, Salo, Seinajoki, Tampere and Turku are also locations we can develop packages to. Please contact us for information on these locations. Scandinavian Gaming Inc. offers tours to every country in Scandinavia. If you want to see more than is available on one tour, please be our guest and add a second tour or as many tours as you like to different locations and combine them for a longer more extensive sightseeing adventure in beautiful Scandinavia. You can add one or many of the above cities to any tour also if you are interested. We also have a number of other fjord tours available upon request. Casino Cosmopol is the Swedish tour partner in Sweden of Scandinavian Gaming Inc. Casino Cosmopol AB is a subsidiary of Svenska Spel Group. Svenska Spel Group is wholly owned by the Swedish State. Booking: To Book a Scandinavian Vacation please fill out the form below and we will have one of our available agents contact you. To Contact Us from outside the USA & Canada please use the feedback form located at the bottom of the page. After trips have been booked and paid for their will be no cancellations or refunds. For more information on our other locations in Scandinavia we have available to travel to or if you have any questions, please contact us thru the form below and a representative will contact you and answer any question you may have. All Scandinavian Gaming Inc. Tours are unescorted. Group Leaders of 25 people or more will receive a free room and breakfast in most locations. Scandinavian Gaming Inc. is a group tour specialist and most of our tours are devoted to groups. Group leaders please contact us so that we can discuss all possible alternatives for your group and custom make a group tour for you and all of your travelers. Tour the Worlds Highest Mountain Range- The Himalayan Mountains and Mount Everest Would you like to take a vacation to another exotic location on earth. Scandinavian Gaming Inc. can offer a special excursion package to tour and trek the Himalayan Kingdoms of Nepal, Tibet, Bhutan and India. Please contact us for information on these very special tours to the World's Highest Mountain Range- The Himalayan Mountains and the World's Highest Mountain Mount Everest. Visit China: Custom made trips to China including Beijing, Hong Kong, Shenzen, Deng Feng and more: Take your group and see beautiful China. Please contact us for more information. All prices are listed in U.S. Dollars and are subject to change due to room availability or other factors. Scandinavian Gaming Inc. Boca Raton, Florida USA To contact us from International locations and from the USA please use the feedback form. Scandinavian Gaming Inc. reserves the right to upgrade to a different hotel if our priced hotel is sold out. Prices will change accordingly. Legal Disclaimer: Scandinavian Gaming Inc. and its partners are not liable for any damages to hotel rooms caused by the occupant or for personal injury or loss of property while traveling on our tours. All travelers travel at their own risk. Please enter information in all fields including a comment so we do recieve your feedback.